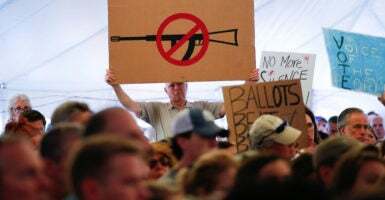 In other words, the plaintiffs believe that Bushmaster’s advertising scheme violated Connecticut’s unfair trade practices law because it encouraged the use of its weapons for unlawful purposes. Those appeals were especially effective with Lanza, they say, since he was an avid player of violent video games and aspired to a career as a special operator in the armed forces. Though Lanza had access to a cache of weapons—including handguns, shotguns, two rifles, and three swords—the plaintiffs said Bushmaster’s promotions prompted Lanza to choose the XM15 from his family’s stockpile, thereby making his shooting spree far more deadly. However, Lanza did not himself buy the XM15—he stole the gun from his mother, who purchased it lawfully from a retail gun dealership in March 2010. For that reason among others, the Connecticut Supreme Court acknowledged the plaintiffs will have a hard time proving their allegation. Lanza killed 27 people Dec. 14, 2012. After murdering his mother, he stormed Sandy Hook Elementary at 9:30 a.m., when he killed 20 students and six staff members. Several others were wounded. The student victims were 6- and 7-year-olds in the first grade.